When it comes to finance many people are put off by strange-looking, perplexing terms. With a little digging below the surface, however, you will find that what seemed daunting at first is in fact not that complicated. Such is the case with ‘equity ratio’. The following article will attempt to outline exactly what this is and how you can use this knowledge to further your financial standing. For example, say you have a car that is worth 10,000 and is therefore an asset. You may owe 5000 on the car in the form of a loan. In this case the car is 5000 of equity: 10,000 – 500. In some cases, the equity can be negative if the loans or liabilities are greater than the worth of the asset. There is also shareholder’s equity, which works in much the same way. The shareholders’ funds are the equity of the company and are divided among the shareholders as common assets. In cases where this is a negative, it is often termed ‘shareholders’ deficit’. Now we can tackle the subject of equity ratio. This strange-sounding financial term is simply showing the amount of owner capital (from the owners’ investments) that is used to fund the company assets. The equity ratio of a company calculates the amount of assets funded by owner capital by comparing the company’s total equity to its total assets, ignoring any financing by debt. The calculation can be arrived at by looking at the company’s balance sheet, or at its financial statement. This is known as the ‘book value’ of the company. If the equities of the company are publicly traded, then the equity ratio calculation can be made by simply using the market value. It is important to understand this term as it is one of the most commonly used ratios in finance throughout the world. This is particularly the case in Europe and Japan, though North America does tend to use the term ‘debt to equity ratio’ instead. 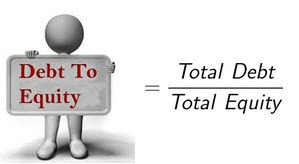 The equity ratio indicates the amount of leverage that can be used by a company. In simple terms leverage, or ‘gearing’, is a method that uses borrowed money to buy an asset. When this happens there is an expectation that after taxation, the asset will in fact rise in worth and thus exceed the amount that was used to buy it in the first place. Therefore, the equity ratio quantifies the assets that stockholders finance rather than the ones that are held by creditors. The lower the equity ratio the better it is for the stockholders so long as the company continues to earn well on the assets – i.e. a higher return rate than the amount of debt being paid off.